We had a lovely day on Sunday taking in the quaint Fashion History Museum in Cambridge, Ontario. 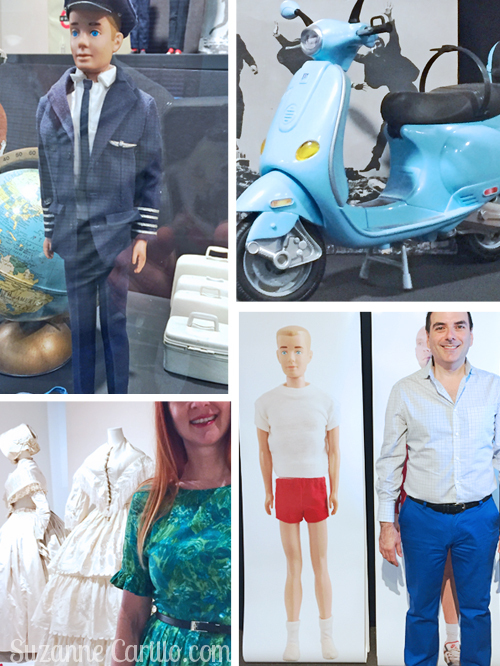 They had three exhibits, one called, “What I Did On My Summer Vacation” based on photos taken from the another exhibit called, ” Barbie’s Boyfriend Ken: The Vintage Years 1961–1967″ and “Tying the Knot: 200 Years of Wedding Attire”. 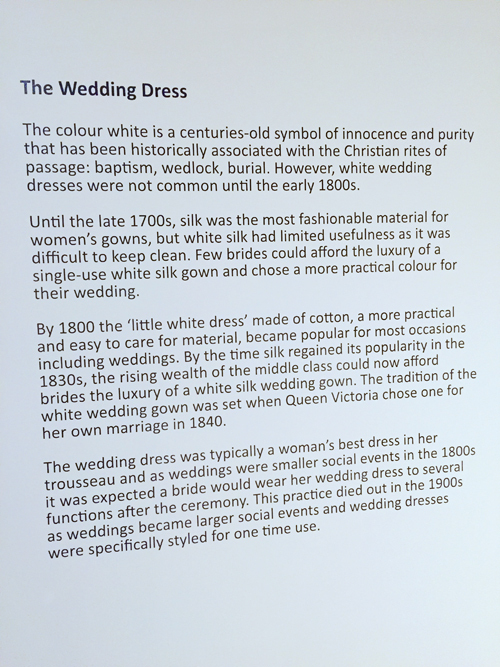 The wedding dress exhibit was small but well curated. 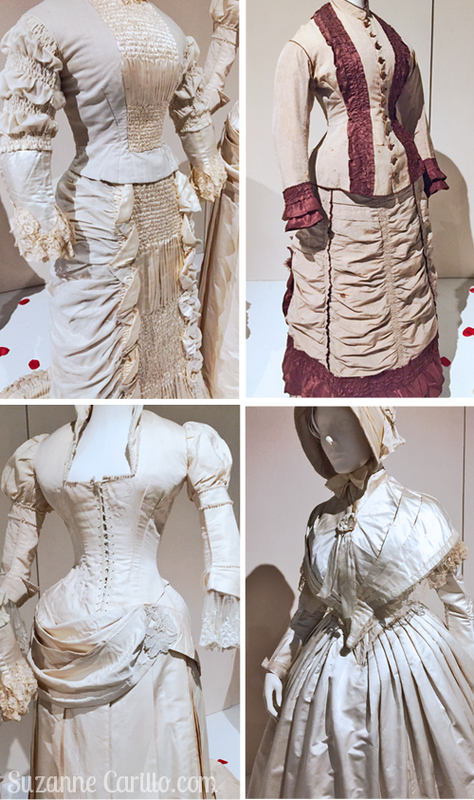 Through time wedding dresses became less detailed and complex. I was in awe of the immaculate ruching and intricate lace detail on the dress, upper left, pictured below. Extreme couture in its purest form. 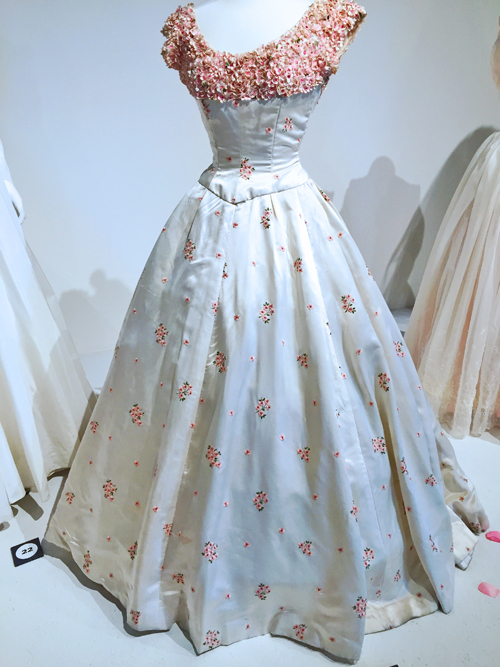 This 1950’s vintage wedding dress was the one from the exhibit I would have gladly worn (had I had a wedding) …magnificent! The Ken doll exhibit took me back to my childhood even though I never owned any of the cool Barbie accessories they had on display. We marvelled at the timeless clothing as well. Isn’t that pilot’s uniform brilliant? Also, I love the set of suitcases! That is Robert below posing with the life size blow up of a Ken doll and I’m down in the corner trying to squeeze myself into the wedding exhibit. Ken had very skinny legs. Did you know that Ken had a best friend called Andy? I didn’t. 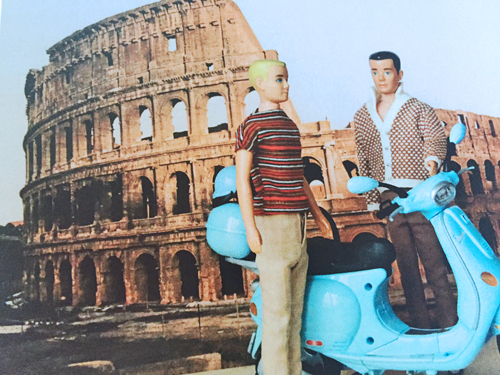 They spent summers together and later travelled around the world on a spiffy Vespa. Who knew? Honestly, when I was playing Barbies I didn’t care one bit about Ken. My Barbie was busy going out with Apollo or Starbuck, sometimes both of them on the same night if she was in a partying mood. She was a social butterfly. Both the Hardy Boys brothers were calling her non-stop and sometimes David Cassidy from the Partridge Family would call, but I remember she often brushed him off, he was a bit too passé for her tastes. Now I don’t need a Barbie to play dress up. I do it myself. I have learned to curtail my youthful appetite for multiple gentlemen callers, but I haven’t given up my obsession with clothing. My outfit for the day was a vintage 1950’s dress I picked up while shopping with Ally and Patti during our mini blogger meet-up. I felt I fit in perfectly with the venue. 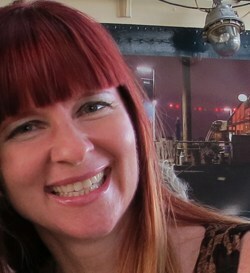 My friend Anja from Curly Traveller sent me that sweet badge. I plan on returning to the Fashion History museum again when they switch out their exhibits as I thoroughly enjoyed it. The museum is located in a sleepy little town down the street from an old fashioned bakery that makes a “just-as-good-as-Grandma’s” blueberry pie. Fashion and food? Say-no-more! I’m in. As we eloped I’m curious to those of you that married in the traditional sense, do you still have your wedding dress? Have you ever worn it again? What do you plan on doing with it? I think Barbie was really the beginning of my love of fashion. She had some amazing outfits!! Very high style!! Even at that time I knew I wasn’t cut from the same jib as Barbie. She was pure fashion fantasy and I was in “The Zone” right along with her. Ken was a bit boring. My bohemian style wedding dress is saved in a big coat box. Our ceremony was in my aunts back yard. I wore a daisy and rose chain, not a veil. Very 60’s wedding with traditional vows but a poem we each chose to read. We hit 41 years in June! YAHOO!! Wow! That sounds amazing. I would LOVE to see photos! Congrats on 41 years. That is a real accomplishment. That really does look like a great museum! I am in love with that dress that you loved as well! Incredible detailing! The Barbie section looked cool too! I had no idea that Ken had a best friend either! LOL! 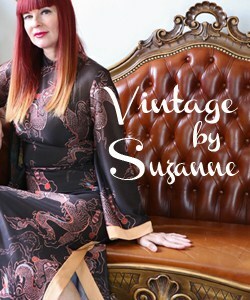 Your vintage dress is incredible and such a beautiful color! Love the little added badge to your bag! I still have my wedding dress, I still fit it but I haven’t worn it again. I almost feel I should make it into something. It came with gloves that matched and I have worn those a few times. 😀 😀 Hehehe, David Cassidy – OMG, did I have a crush on this guy a million years ago! your dress is wow and the bag is the matching eye candy. That is some serious eye candy! You know I love this, Suzanne! It combines fashion and history — what’s not to love? The coolest Barbie thing I ever owned was a yellow satin disco suit for Barbie. She wore that puppy all day everyday, ’cause you never know when you might feel like dancing. And, like you, I didn’t play with Ken at all. I don’t think my sister or I had a Ken doll. My brother had a GI Joe but we usually ignored him. I just sent you an email. You’ve inspired me to add this museum to our travels in Ontario in September! The Museum looks fab. Alas I have no Barbie or Ken tales to tell as I never had those sorts of doll (dunno why). I do still have my wedding dress and I have re-worn bits of it – the headdress, the silk flowers, a moss green velvet corset belt, the shoes. The rest of it I’m saving for a Miss Havisham moment. It isn’t a meringue dress, but it does have a lot of tea-dyed lace – great memories of the making (and of the day awwwwwwwwww). I love that dress. If I didn’t like you so much, I’d be jealous of your ability to wear it so attractively. This green dress is so perfect for you. Very very pretty. You always look so great in styles from the 1950’s. I did not even own a Barbie doll. I just dressed up my pets. And I still do! Never had a wedding either. I didn’t seem to inherit that wedding dress gene that so many girls have. We eloped to City Hall in NYC. I wore a pink and tan linen suit. Don’t judge. It was the ’80’s. Are the wedding dresses part of the permanent collection? I saw a great wedding dress exhibition at Munson-Williams-Proctor in Utica, NY a few years ago. I think it traveled from Delaware. I did a traditional ceremony and I wore my great aunt’s wedding dress (she wore it in 1931) which was her great grandmother’s from 1860! I have it safely stored. The husband became a wasbund in 1993. What a fun museum and love the exhibits. 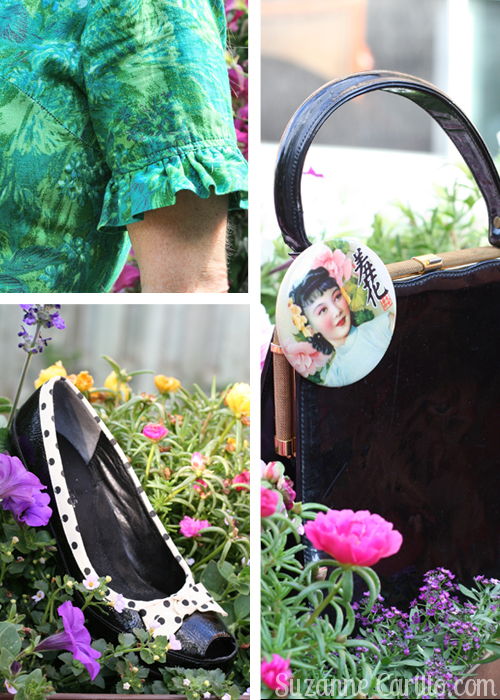 You really do fit right in with your vintage look, I love the pin on your purse. First, your green dress is just dreamy, and you wear it so well. And second, what a great museum! Your vintage dress is lovely! I’ve always liked green and blue together, and the little ruffles on the sleeve are a delightful detail. Some day I must visit that museum. I purchased my wedding dress from a vintage Store – it was a lovely cream 1950’s dress with a million covered buttons down the back and a giant net and lace covered skirt. Someone stepped on the skirt at the reception and tore it, and I gave it away. The marriage didn’t last either! Your new vintage dress is gorgeous on you. Ally & Patti are good luck charms obviously! Loving the sound of both those exhibitions. Most of us Brits grew up with Sindy – a doe-eyed, pear shaped girl with horse riding, ballerina and bride outfits and sadly no male counterpart so mine had to make do with my brother’s rough Action Men with their 5 O’clock shadow, army fatigues and scarred cheekbones. Ken’s mate is a bit of a hottie. I bet Robert was envious of their snazzy wardrobes and Scooters. Vix – there WAS a boyfriend (never heard of him either) called Paul. Thanks for the memory! I grew up in Britain and also had a Sindy doll. Always wondered what happened to her. I guess Barbie took over? As for a wedding dress, I had a gorgeous Beverly Summers gown. It was in the eighties, very Princess Di with big sleeves, big skirt and fitted waist. Sadly got lost in our move to the US. I would love to have it now, would be vintage! Thankfully I have my wedding album so can still look back and am not too embarrassed to look at the big dress, big flowers, big hair…..everything was big in the eighties! That wedding dress is stunning. As is the green dress that you’re sporting…the color is perfection on you. I was obsessed with Barbie when I was little and while I thought David Cassidy was pretty delightful I was more into his lesser known brother, Shaun. Oh yeah, I had a poster on my wall and everything…. Incredible. I love everything about this post – especially that 1950s wedding dress… Amazing. Love the shape of your green dress and a how it hangs, such a beautiful piece. That 1950’s wedding dress is stunning! The exhibition and museum look wonderful. And your new dress as well, you look gorgeous (I love the colour). 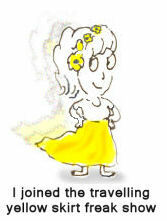 Thanks for a fabulous post and a trip down Barbie Lane (I had one and made clothes for her too). I didn’t know Ken had a friend, in fact hardly knew about Ken at the time! So interesting about the wedding dress!!! I loveyour green dress too! So pretty!